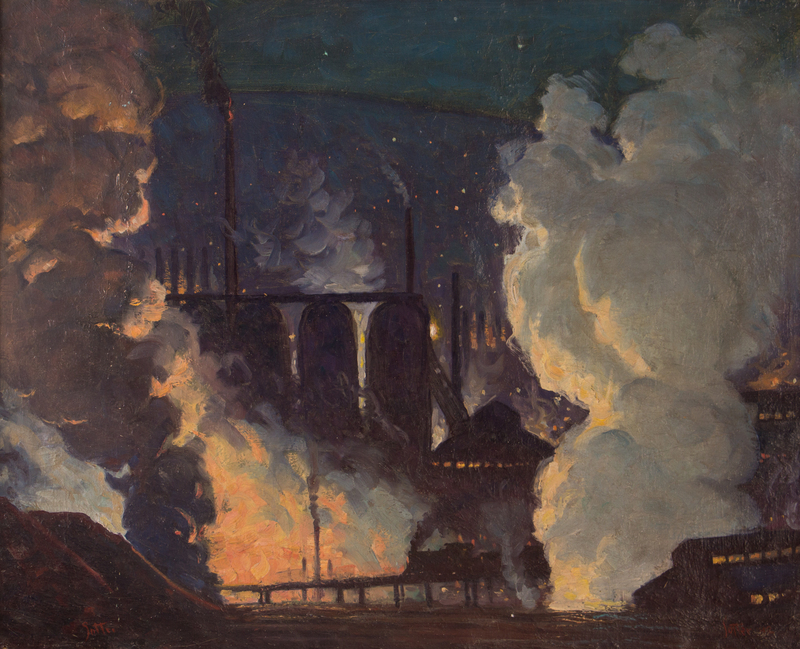 Artist: George William Sotter (American 1879-1953) | Title: Fiery Blast Furnaces at Night, Pittsburgh | Date: 1942 | Photography Credit: Kaela Speicher, Concept Art Gallery. Even in this app-centric century, it’s an excellent idea to inspect art, furniture, glass, jewelry and other expensive things of beauty in person before you buy. There’s no need to don a deerstalker cap but do channel your inner Sherlock Holmes. Here are some places where you can track down quality finds. From Black Lamb Consignment in Carnegie. This decorative Asian porcelain plate is $75. Founded in 1972, this gallery exhibits the work of local artists and conducts regular auctions of fine graphics and paintings, photography, sculpture, antique and mid-century modern furniture, glass, lighting, silver and estate jewelry. Past auctions have included art by George Sotter, George Hetzel, Samuel Rosenberg, Romare Bearden, Roy Hilton, Aaron Gorson and Henry Koerner. At 1031 S. Braddock Ave. in Regent Square. David Kozloff and Mark Meaders have operated their business for 29 years in chic Shadyside. The duo sells art, glass, porcelain, bronzes and especially estate jewelry, including sterling silver, yellow gold and art deco platinum plus early Victorian pieces from 1800 to 1850. At 5883 Ellsworth Ave. No. 1 in Shadyside. With 14 vendors, this well-maintained mall is spread over 10,000 square feet. There is a wide array of art, costume and estate jewelry, coins, furniture, glass, retro kitchen accessories, primitives and Toleware. You can buy a Kittinger desk here or six Danish teakwood chairs. Just eight blocks from Downtown at 17th and Smallman streets in the Strip District. This beautifully arranged shop recently sold Colonel Willard Rockwell’s walnut dining table with eight chairs. Rebecca Sohn, who opened her business in 2009, said the set was custom made for Col. Rockwell’s Edgewood home. Besides high-end furniture like Baker and Henredon, browsers will see art, Asian china, table settings, rugs and curiosities such as a doctor’s black leather medical bag. At 23 E. Main St., Carnegie. The affable owner, Mark Evers, has sold art and antiques for 30 years and this Oakland shop is as elegant as a New York art gallery. Buyers can find brass-mounted and ebonized display cabinets like the ones owned by the late Bunny Mellon. There are breathtaking chandeliers and sconces made of gilt bronze, cut crystal and rock crystal. There’s lighting by English designer F & C Osler plus chandeliers by Edward F. Caldwell, who supplied illumination for the White House East Room. At 4951 Centre Ave., in Oakland.